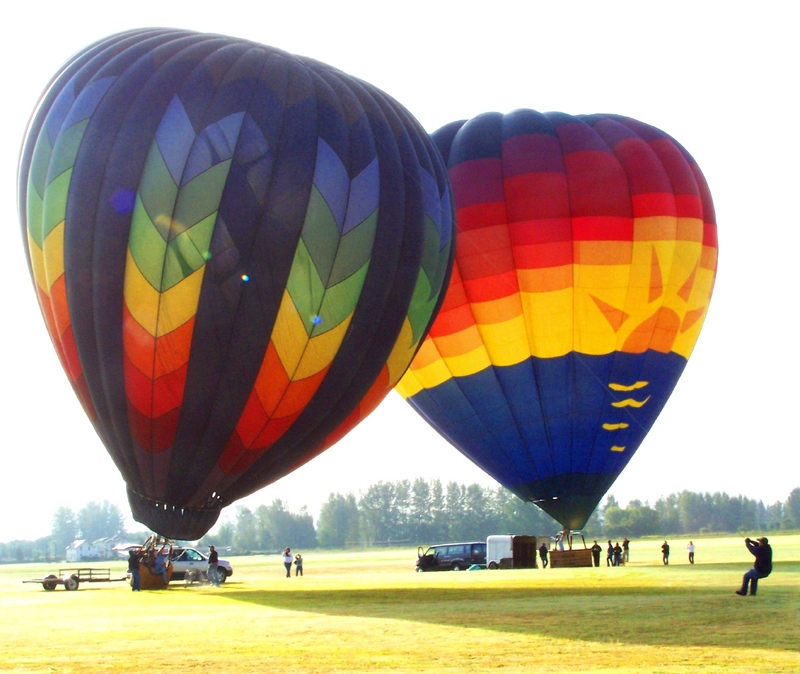 Take hot air ballooning. 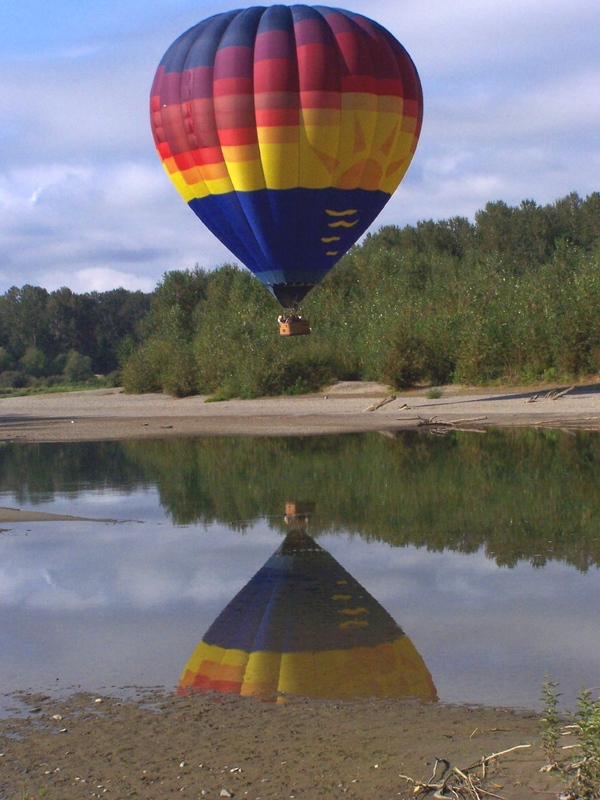 I won a balloon ride for two in a benefit auction. Thinking I would take a new friend, when that friendship fell apart, I simply waited to discover who else would be going with me. I had almost a year to decide. Within two months, my daughter called me one morning to say she had just experienced an amazing dream with a hot air balloon landing in her urban back yard. We both got in and traveled over the globe, touching down on lots of islands in the Pacific. She did not know consciously that a certificate for a balloon flight reposed in my desk drawer. But obviously, the “eairth” communicated with her psyche. “Would you like to manifest that dream?” I smugly asked, knowing her response would be, “ Of course.”. Imagine a scrunched up, long, maybe 150 feet long, “wudge” of what looks like colorful fabric lying pancake flat on the ground. A flimsy looking little basket is attached with ordinary cotton ropes to the flat fabric “wudge.” What looks to be an ordinary electric fan gets dragged from a van and positioned at one end of the fabric while two people lift up the edges to reveal an opening. Someone else turns on the fan. Ahhhhhhh, it’s an envelope of light weight fabric that ripples and flutters and rolls like waves before the pressure of the air. Within moments, the fabric begins to rise, to mound, to take the shape of a pregnant belly, all because the envelope traps this invisible substance we call air. As the envelope rounds higher and higher, it begins to lift off the ground. A man holds a long rope attached to the top of the balloon and leans with all his weight away from the lift to keep that trapped air on the ground long enough for us to clamber into the basket. A low, low wall, our only protection from spillage – simple wicker and rattan, made as in days of old because it still seems more rugged and flexible than the best of our synthetics. But still, wicker and rattan lashed together. No parachutes, seats and seatbelts, no food service nor drinks offered, just gas tanks lashed to the sides, rubber hoses, loosely twined around the rattan arches, lead to the torches suspended at the balloon’s lower opening. Release compressed gas and it roars with fire, heating the air trapped by the cavernous bulbous envelope. We rise, so gently we hardly notice our air born status. In between the roars of a gaseous dragon, we float quietly skyward in our own small ship of fools. Think about the danger…one tall man, the wall reaching no higher than his thigh, could easily spill out. He doesn’t have room to kneel and so asks if he can trade places with my daughter, who is nestled in a slightly higher corner. Though she is only 5”2”, the wall where he’d been standing still comes only pelvis high. We rise and fall, rise and fall, dancing with our companion balloon and making photo opportunities a continuous stream of clicks. 1500 feet we rise at our zenith. So here we are trusting our bodies to space and good fortune. Not even the finest of lines separate scared and sacred. I’m in awe…literally experiencing heaven on Eairth. More about Eairth in a day or two – stay tuned and please respond with your own stories triggered by this one.. This entry was posted in wonder and tagged death, exhilaration, gusto, life, living, magic, risk, wonder. Bookmark the permalink.